neighbour. I also had the company replace my roof last fall and was totally pleased with work and the clean up. Kyle was very good to work with, I would certainly have his company do any other work I might require in the future. Would recommend Ottawa Home Exteriors to my family and friends. Excellent company to work with! We are pleased with the result. A quality product, amazing customer service, flexibility when we kept changing our minds. I would definitely recommend Ottawa Home EXteriors! Thank you for the positive review! Your satisfaction is important to us. We appreciate your feedback and your business. Work was completed as contracted. Very professional group. Even returned to clean the outside a few days later. After 16 years it was time for a new roof.... oh no roofers ! We got 3 quotes and OHE came in with the best price which was great but the most impressive part of the job was the service, the crew and the follow up. Even my neighbours remarked about their great work habits and job site behaviours. Thanks for the great reference Wilson! Kyle was great to deal with and ave the best price in town. He showed up on time did everything he said he would do and his crew was great to deal with. When they finished the clean up was great . Thank you for the great review Frank! It was a pleasure working for you, our crew really appreciated you leaving the go hut on site from your family reunion weekend! If you want a professional team that treats your home as carefully as you would, then you want to contract Ottawa Home Exteriors. Kyle and his team arrived early and stayed late every day. We brought Kyle in, in the spring of 2016, to fix our cold 1970s home. Once teardown was complete, the sources of the cold were apparent. Kyle texted us pictures of what he found at our home and worked flexibly and rapidly with us to implement air tight, rigorous and top quality solutions. The scope of the work expanded due to issues only visible upon teardown, and Kyle had his team work into the long weekend to ensure that our project was fully completed before he started his next booked job. Our neighborhood is full of projects that have been abandoned by contractors who move on to the next job and promise to return to a job that is taking longer, leaving these homes and theie partial work exposed to the elements (plywood, house wrap etc.). Kyle took his commitment to us seriously and finished the job entirely by before leaving. His whole team's workmanship was top notch, in invisible as well as finished areas. The work area was cleaned up every day. We have full confidence in our home now and into the future. We have received dozens of compliments on the end result of Kyle's team's workmanship and have recommended OHE to many neighbours. If you want a team that treats your home as carefully as you do and keeps on task and on budget, then only OHE will do. Thank you for the great review and your faith in OHE. Ottawa Home Exteriors did an excellent job of repairing and re-shingling our roof in 2015. Work was done in a timely manner for a reasonable price. A thorough quote and recommendations were provided. Team is polite and conscientious. Clean-up was excellent. I highly recommend the company. It was a pleasure working for you! Thank you for the Senators tickets! Ottawa Home Exteriors re-shingled my roof last year. I got several quotes and observed other roofers in my neighborhood (I knew who to stay away from). I felt Kyle was the most honest quote and trustworthy, his quote had all the recommendations and products as outline by Timberline, not like other roofers with hidden costs and using substandard products like tar paper, cheap shingles (Other roofers - Oh that will cost you extra for the good material). The crew showed up as planned and completed the project as expected in 2.5 days at the stated price, which lead to several others in my neighborhood re-shingling their roofs after watching Kyle’s team work on my roof, he spend a lot of his Summer in my neighborhood. I would high recommend Ottawa Home Exteriors to anyone needing to re-shingle their roof. Thank you for the referrals as well! Kyle Dotto, the owner of Ottawa Home Exteriors, provided us with all the information we needed to choose the best products we wanted. Something we really appreciated was there was no stupid questions, he understood our need to learn about the products available and the installation requirements. He and his crew did a really top quality professional job and did not hesitate to do the extra bit when unforeseen problems were found. We are very happy with both roof and siding and recommend his company for anyone interested in good quality work at a competitive price. 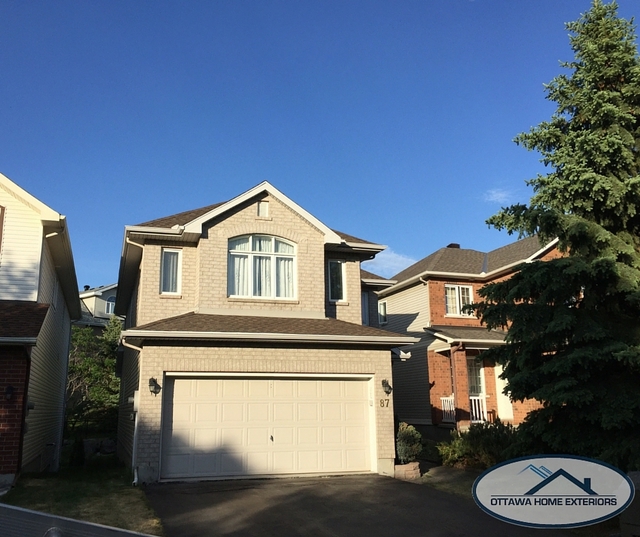 For quality workmanship, competitive pricing, fully licensed installers, superior customer service, and brand name products you can trust, look no further than Ottawa Home Exteriors for your next project.